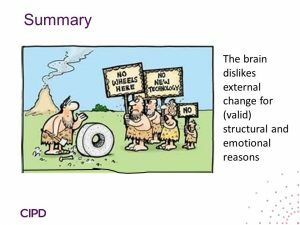 We recently ran a workshop on Implementing Effective and Brain Friendly Change Management as part of the CIPD Behavioural Science Conference. The session focused on how our increased understanding of the brain offers us the opportunity to improve personal and organisational change management in very practical and tangible ways. With plenty of change experts in the room we had some great insights into how neuroscience can help explain previous change challenges and successes and allow us to make change a more positive and successful process. If you would like a copy of our ‘Brain-friendly Change Checklist’ please get in touch.